Is Thundernews The Right Choice for Usenet? 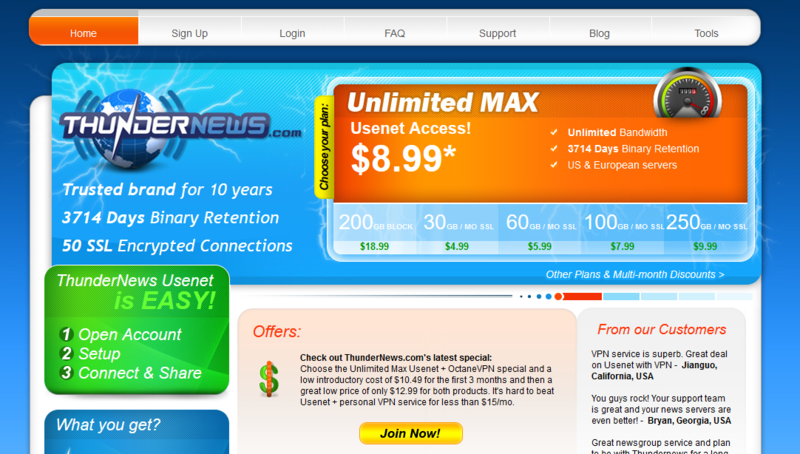 ThunderNews has been a Usenet Service Provider since 2004. So they have attracted a large and loyal following. Â One reason they have been able retain such a loyal customer base is by providing customer service that is second to none. Rest assured someone is always available to answer a question or figure out a solution for your problem. Â Their users are so happy with their ThunderNews account that they spread the word to others. To be able to retain such a satisfied user base Â in the Usenet Industry says alot about a Usenet Service Provider. ThunderNews has a multitude of Usenet Plans. There are six monthly download plans with 50 connections, SSL and EU and US severs. Not to mention 2,293 days of retention. Receive a discount if you purchase a 3, 6 or 12 month term. Their unlimited plans includes VPN add on. Â We believe that is the best value. 2,292 days binary retention and 1,254 text retention Their servers peer with hundreds of other Usenet news servers Â so rest assured you will have access to every newsgroup available . If there happens to be a Newsgroups you can’t find you can ask them if they can add it for you. Want to start your own Newsgroup. You can contact support and they will do their best to help you get it setup. You receive 50 simultaneous connections with Â ThunderNews monthly accounts and 10 connections with their block accounts. Â Speed will not be an issue they offer lightening broadband speed connections. Their multiple access ports will assure you gain access. ThunderNews offers a free customized version of News Rover. Â News Rovers has many features for instance search capability , image viewer, multiple server support, spam filters and SSL capability. Â You can always use NNTP complaint newsreader as software as well. They offer a VPN with their Premium unlimited plan. VPN will secure all your online activity not just usenet. Your IP is replaced with Thundernews IP so you know your connection is secure. It acts like a virtual firewall. ThunderNews offers chat, knowledge base and support tickets. They are available 24/7 to assist you with whatever questions you may have.The response time can be as fast as a couple of minutes but normally no longer than an hour. They take pride in the quality of customer service they maintain. ThunderNews has done a tremendous job of creating accounts that fit a wide array of users. If you still aren’t sure what you need their staff is standing by to help you make this decision. Make sure to take the time to read what their users had to say about their service. I am sure if you signup for an account you will fast become one of many of Â ThunderNews Loyal Follower!